Mercury is the smallest planet in our solar system. It is also the closest to the Sun. This bizarre lifeless world orbits the Sun in a highly eccentric orbit and is locked in orbital resonance with the Sun. This means that every time Mercury makes two rotations around the Sun, it also turns three times on its axis. Consequently, two Mercury "years" are equal to three Mercury "days". This planet is difficult to observe because it is small, fast moving and close to the Sun. However, you can see it soon after sunset or just before dawn if you know where to look. Keep reading to learn more about Mercury's surface, atmosphere and exploration. At first glance Mercury resembles the Earth's Moon. It is covered with old impact craters and cracks. Images show ridges, some of which are hundred kilometers long and up to 3 kilometers high. These probably formed when the planet cooled and shrank billions of years ago. Some craters may be the result of old volcanic activity. The smooth plains visible around them indicate lava flow. However, they also may be due to the debris scattered after large meteor impacts. Mercury's atmosphere is so thin that scientists can barely register helium and hydrogen even though they are the most abundant gases surrounding the planet. In fact, the atmosphere is too thin to protect Mercury's surface from the Sun's intense heat. Temperatures on Mercury range from a freezing -275° F at night to a scorching 840° F during the day. Such extreme temperatures make scientists doubt that Mercury could support life. The light weight helium and hydrogen gases constantly escape into the space because Mercury has such a small gravitational force due to its small mass (your weight would be 2.5 times less on Mercury). However, because of the proximity to the Sun, the intense solar wind continually supplies new gases. Fresh helium is also supplied to the atmosphere from the evaporation of the rocks resulting from the extremely high daytime temperatures. The first spacecraft to visit Mercury was the Mariner 10 in 1974 and 1975. Although, it made three flybys it only passed above the same hemisphere and mapped less than half of surface because of the intense heat due to the proximity of the sun. The next mission to Mercury was the spacecraft called the Messenger, which completed three flybys in 2008 and 2009. 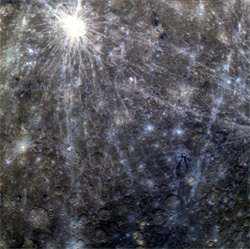 These flybys were able to collect enough data to create a map of Mercury. The Messenger is still in operation and began orbiting the planet on March 18, 2011. If a robotic spacecraft lands in the right place on Mercury it may photograph double sunrise or sunset. First the Sun rises normally, then it stops and moves back towards the horizon in order to rise for the second time. Then it crosses the sky for about 88 earth days. On the dark Mercury sky, the Sun shines together with the stars and its diameter is three times bigger than from the Earth. When it reaches the western horizon it rises again before final sunset. The reasons for these bizarre sunrises and sunsets are Mercury's highly eccentric orbit and slow rotation about its axis due to orbital resonance. The name of planet Mercury has no connection with liquid metal mercury that was once used in thermometers. The planet carries the name of the ancient Roman god of travel and commerce because of its fast movement in the sky. Mercury's surface temperatures are the most extreme in entire Solar system. The planet is alternatively baking and freezing. During the long day, temperatures reaches about 840° F, hot enough to melt some metals. However, during the night temperatures quickly drop as low as -275° F.
An orbit that's elliptical, deviating from circular. The orange planet has an eccentric orbit, while the blue planet's is circular. Seen as a bright streak in the sky (sometimes called a shooting star or falling star) it is a tiny grain of dust or pebble that burns up when it hits Earth's atmosphere and crashes into Earth. The gaseous material surrounding planets; the air that surrounds Earth. 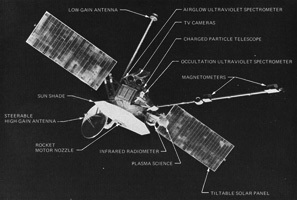 The second spacecraft to reach Mercury (after Mariner 10), Messenger is a NASA mission studying the geology and magnetic field of that planet. 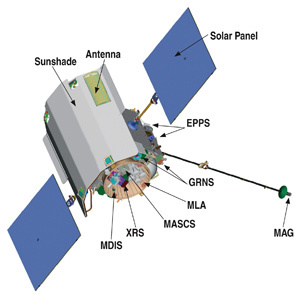 It was launched on August 2004 and entered Mercury's orbit on March 2011. 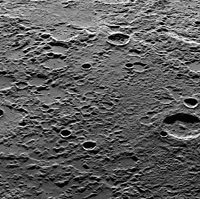 Description Close up of Mercury with Kuiper crater visible at the top left.